I love aquariums. I have visited amazing aquariums all across the country. But I was unprepared for the shock and awe when I approached the massive pyramid-shaped building on a bluff high above the Tennessee River in downtown Chattanooga. 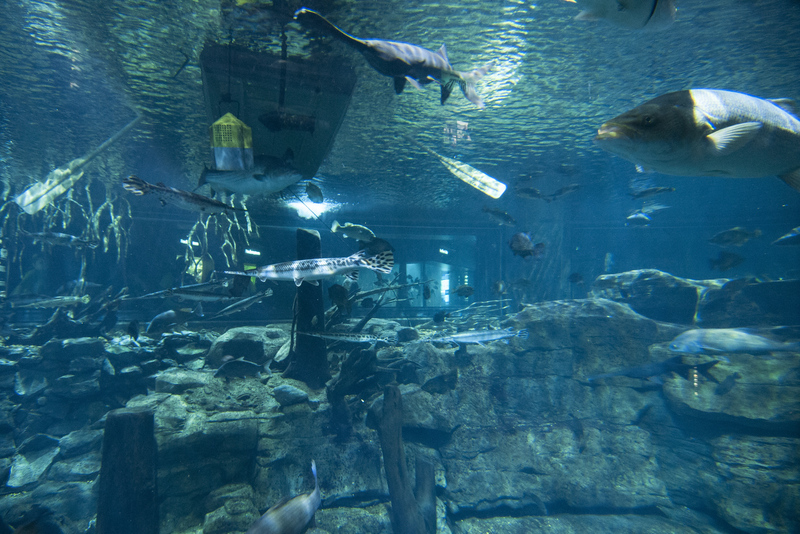 The Tennessee Aquarium is a captivating experience as it fully immerses visitors in the environment of the aquatic world through dark interiors, bright fish tanks, and peaceful ambiance. Padded walls and thick carpets prevent echoes from the voices of hundreds of guests during peak tourism times, creating a quiet and subdued atmosphere. But the aquarium is more than just a collection of fish tanks; it is a full day experience including two separate buildings, the IMAX 3D Theater, the River Gorge Explorer, and an outdoor water experience to entertain and delight children. The Undersea Cavern allows visitors to take a walk underneath the massive saltwater fish tank for a different view of the aquatic life swimming through. The Ocean Journey building begins with a ride up two flights of escalators to the top floor. The bright, warm, and humid Tropical Cove welcomes visitors to the first exhibits. Amy and Angel, two showboating Macaws, entertain the crowds as they move along to the touch tank. Children crowd around the low water table for a chance to touch one of the many stringrays as they swiftly move around the 100′ circumference table. Contrasting the bright and humid environment of Tropical Cove is Penguins’ Rock. The dark interior and cooler temps provide an appropriate setting for watching the penguins plunge in the water for a quick swim. An interesting map of the Earth shows the native locations of various penguin species, debunking the common misconception of penguins at the North Pole. Walking past the large jellyfish display in several tanks, visitors get their first glimpse of the massive three-story saltwater fish tank. Hundreds of fish swim through the tank filled with live coral and a sandy bottom. Bright lights at the top of the tank give you a feeling of floating beneath the surface of the ocean as large sharks and turtles swim overhead. A gentle ramp zig-zags down two stories for a final journey through the ocean. Or, rather, under the ocean. The Undersea Cavern is the darkest place inside the aquarium, giving you the best view yet of the fish swimming overhead in the massive tank. It is a mesmerizing finish to the Ocean Journey, but the adventure is not finished yet. The massive freshwater fish tank can be seen from both sides, but the view from Discovery Hall along one of the gentle ramps is the best. The River Journey welcomes visitors with swiftly darting balls of furriness, otherwise known as otters, at the Appalachian Cove. Rushing water tumbles over a waterfall as birds chirp beneath the massive glass ceiling. Venturing away from the warm and humid space, the Discovery Hall hits you with a blast of cool air as it wows visitors with long and winding ramps surrounded by massive walls of glass holding back the fresh water in fish tanks. At each end of the long hall the ramp leads to a different exhibit area, including Alligator Bayou. The creaky wooden floors and rustic buildings add to the experience of seeing small alligators resting on logs or floating in the shallow water behind a thick piece of protective plexiglass. You might catch a glimpse of one of the birds walking the shoreline a short distance away, or hear their call echo through the air. The journey continues through the Rivers of the World exhibit with fish and plants from Asia, South America, and Africa. Educational panels offer information about life in these waterways and descriptions of the fish on display, but are still quick enough to read that you don’t lose sight of the restless children. The dark halls, bright tanks, and cool air lead from one gallery to another, each time descending down a story on the gentle ramps of Discovery Hall, eventually leading back to the lobby level and the conclusion of an amazing journey around the waters of the world. Although the Ocean Journey and River Journey buildings are more than enough for young children and weary adults, the adventurous or all-inclusive thrill seekers can continue the journey with a couple more attractions: the IMAX theater and River Gorge Explorer. You don’t necessarily have to do these the same day, but you get a discount on the admission if you buy these tickets as a package (package pricing saves you $4 on an IMAX movie and $5 on the River Gorge Explorer). The IMAX 3D Theater is just around the corner from the aquarium, a short ten minute walk. The theater typically has four or five films on hand at a single time, rotating the films periodically throughout the year. But did you catch the 3D part of the theater’s name? Wildlife and landscapes leap off the massive screen, immersing you in the experience (almost) as if you were there. But if you’re keen to get outdoors and truly immerse yourself in nature, try a cruise aboard the River Gorge Explorer. This high-tech boat takes visitors on a two-hour excursion on the Tennessee River while a naturalist explains, well, nature. The specially-designed boat satisfies anyone’s need for speed as it jets down the river, covering large areas in a short amount of time and allowing visitors to see more of the river. But don’t worry; the boat slows down to a paltry 5 mph at scenic locations so visitors can enjoy the view from the deck outside. 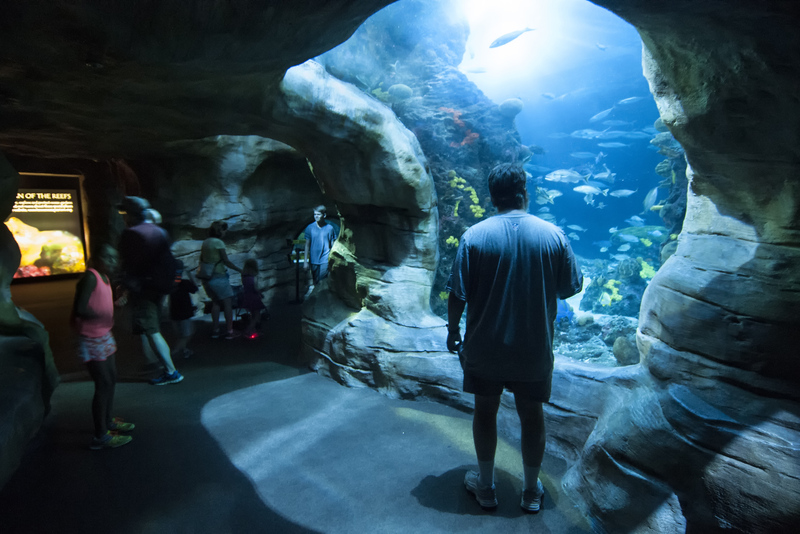 Once you manage to pull yourself away from the immersive experience of the Tennessee Aquarium and return to the world of Chattanooga, you have a lot more you can explore. Take a walk between the two buildings toward the Tennessee River and let the kids play in the tumbling water cascades that passes underneath the highway. If you’re hungry head across Market Street to Cheeburger Cheeburger, a place where diners “invent” their own burgers and milkshakes from the bun up. If you want a scenic walk, take the short climb up E. Aquarium Way to the Walnut Street Bridge, the longest pedestrian bridge in the world. As a treat, you can grab an interesting dessert creation at The Ice Cream Show on your way back. Admission PriceAquarium admission is $29.95 for adults, $18.95 for children 3-12, and free for children under 3. Add $6 for an IMAX movie or $27 for the River Gorge Explorer. Visit their website for a full list of prices and packages. ParkingThere is no on site parking for the aquarium, but lots of private lots and parking garages nearby. Handicap AccessibilityThis is one of the most handicap accessible attractions I’ve seen in awhile. Each building includes escalators for those with walking disabilities, and elevators for those in wheelchairs. Gently sloping ramps take visitors from one floor to another. There are plenty of plush benches to give you a place to relax your legs for awhile.